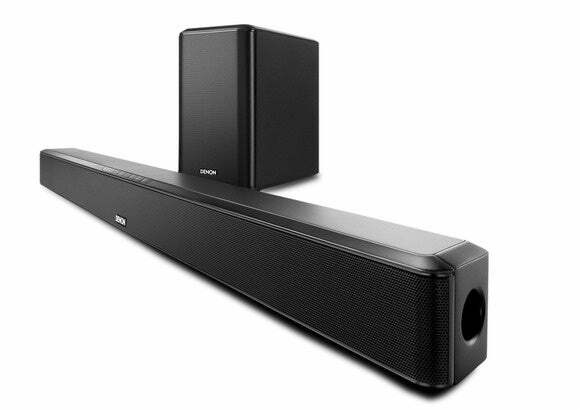 The Denon DHT-S514 is a rectangular block of a sound bar, 40 inches in length and squared off like Stallone’s jaw. But appearances can be deceiving: The sound bar feels flimsy, not stout, and the relatively tiny forward-firing subwoofer doesn’t inspire confidence, either. The DHT-S514 is a 2.1-channel unit, packing 175 watts of total power, which puts it on the less powerful side of the sound bars in this roundup. Still, that ought to be enough power for a typical living room, but the Denon’s audio quality suffered no matter how much fiddling I did with its settings. At high volumes, the DHT-S514 is boomy and stricken by problems with echoes. At lower volumes, the audio was much more tolerable, but here dialog and finer effects in movies tended to vanish into the ether. I didn’t have much better luck with music, either. Rather than filling the room, the DHT-S514 sounds decidedly monaural. Connectivity options are fine, including one HDMI input and a TV pass-through, 3.5mm analog input, plus digital coaxial and optical ins. Bluetooth is supported, too, and the unit includes an IR blaster to help simplify your entertainment cabinet (along with a number of extra cables, and who doesn’t like a free HDMI cable?). The subwoofer is wireless, but note that there is no remote control of this component—if the bass is too loud, you’ll have to walk over and adjust it by hand using the knob on the back. Despite its relatively simple design, using the Denon was more complicated than the other sound bars in this roundup. I wouldn’t have thought a remote control with only eight buttons would have me scrambling for a manual (it’s included on a CD or available online), but figuring out what the various sound field modes did and how to interpret the panel of lights on the front of the sound bar isn’t exactly intuitive. The DHT-S514 includes backlit buttons directly on the unit, and these lights double as status indicators for volume and other mode settings. You’ll need to remember that when the middle two lights are on, that means you’re in “dialog” mode, while three sets of two lights is for “movie” mode, and so on. That said, these modes weren’t useful in my testing, providing only minimal changes to the sound field. A hit-or-miss night mode is also included. Denon is a top name in audio gear, but this sound bar doesn’t represent its finest hour, particularly in the face of more fully realized competition. Denon is one of the best names in audio, but this sound bar is not one of its better speakers.